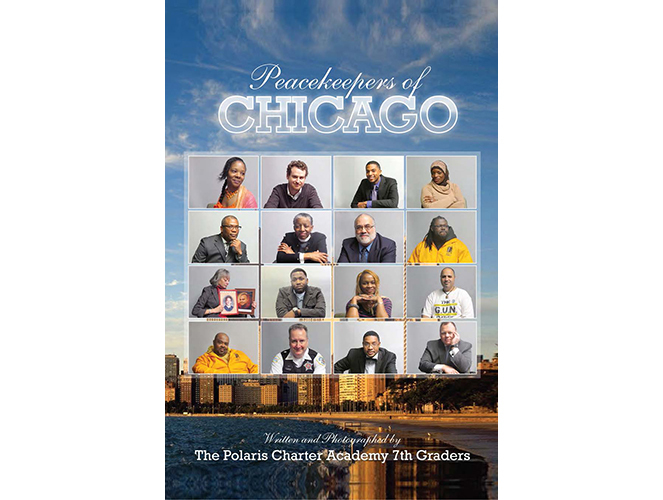 Seventh grade students from Polaris Charter Academy created this book, Peacekeepers of Chicago, to honor their local community members who serve as peacekeepers. 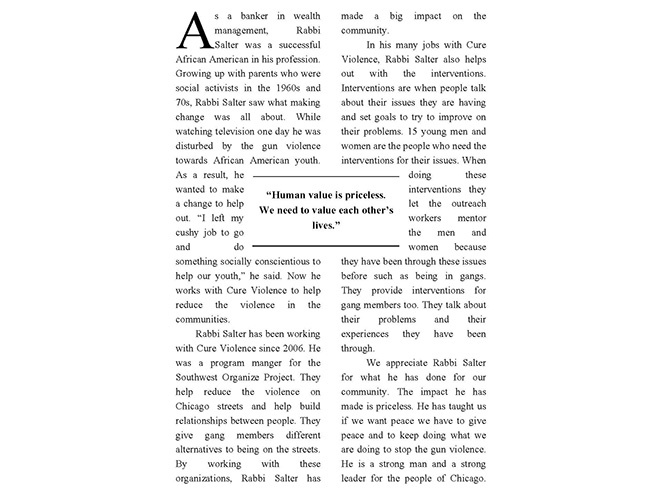 While studying the U.S. Constitution and learning about the second amendment, Polaris students collected data on gun violence in their own neighborhood, West Humboldt Park in Chicago. 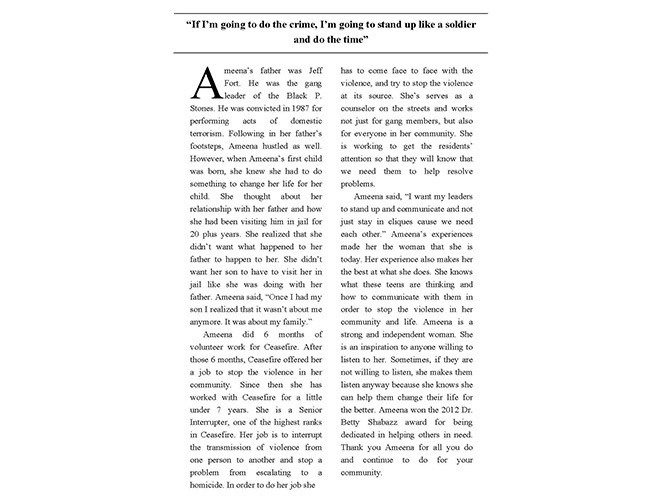 The statistics, showing high numbers of fatalities near the school, and their own personal experiences with violence compelled them to take action. They decided to complete two projects: a citywide “Day of Peace” event and writing a book to honor the stories of local citizens working for peace. 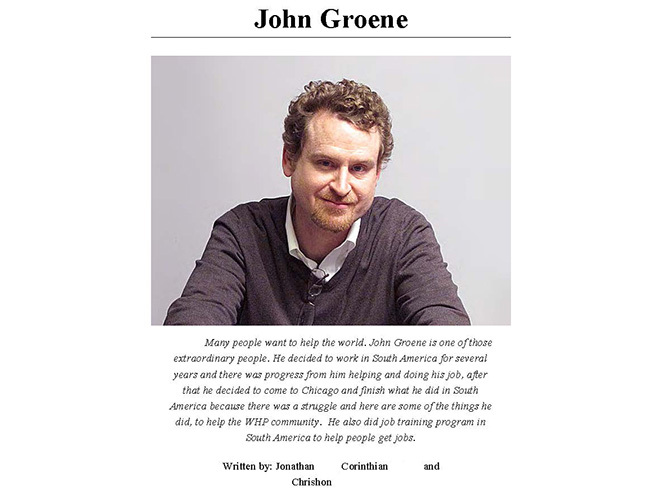 Peacekeepers of Chicago consists of biographical sketches and photographic portraits of select community members. The process of creating this book started with a mentor text: Small Acts of Courage from King Middle School from which students learned the criteria for a biographical sketch. Next, teams of students worked together to find people who they were interested in interviewing and to develop interview questions. Once the community members were selected, each interview was filmed so that students could review the tapes during the writing process. Students worked in groups of three to write each biographical sketch. 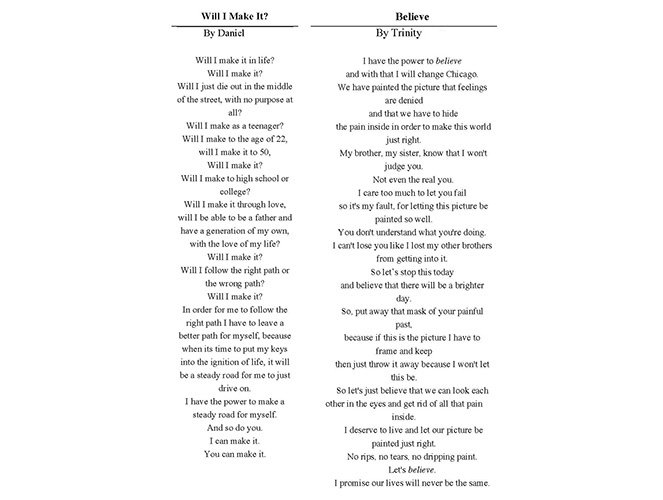 Each sketch is written as an argumentative piece and includes both qualitative and quantitative evidence that defends the claim that each person deserves the title of “Peacekeeper.” The creation of this book took students through the entire writing process of planning, revision, editing and rewriting their texts. The revision process included peer critique sessions. The students also worked with a local photographer to learn how to take the portraits featured in the book. 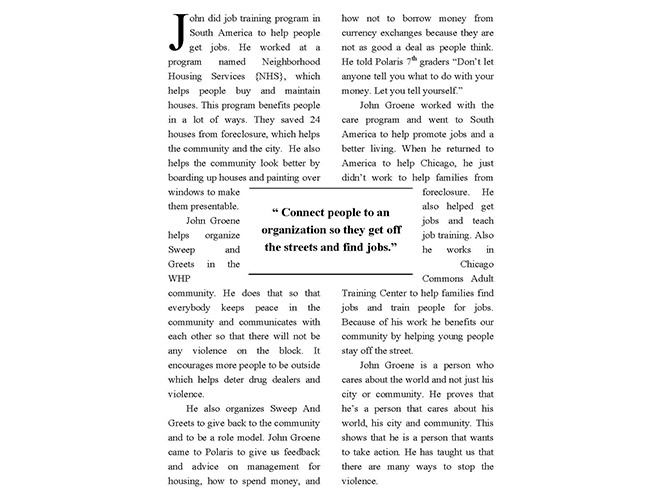 The final version of Peacekeepers of Chicago is professionally published. 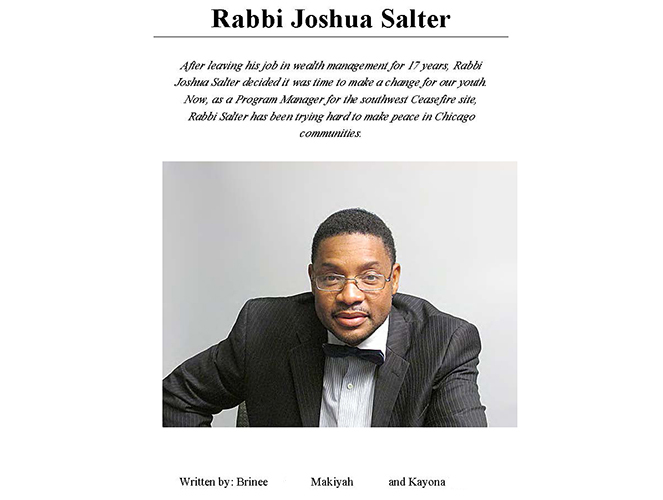 The book is also available in the Mayor Daley Branch of the Chicago Public Library. To see Public Service Announcements that the Polaris students created in collaboration with students from Westinghouse College Prep High School to promote the “Day of Peace” click here. I can use resources to build my vocabulary.